This California themed gift tower makes a grand impression for the Holidays. Three glittering boxes are stacked and filled with the finest from California. Savor a beautifully crisp Napa Valley Beringer chardonnay and a full-bodied, smooth Beringer cabernet sauvignon. 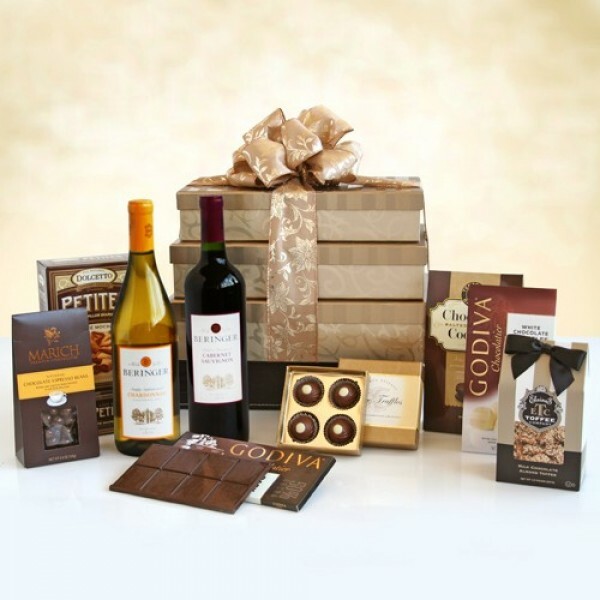 Enjoy these with decadent chocolates, including truffles, cafe mocha petite cookies, chocolate-covered espresso beans, Godiva white chocolate truffles, milk chocolate almond toffee, chocolate salted caramel cookies and a Godiva dark chocolate sea salt bar. Indulge!